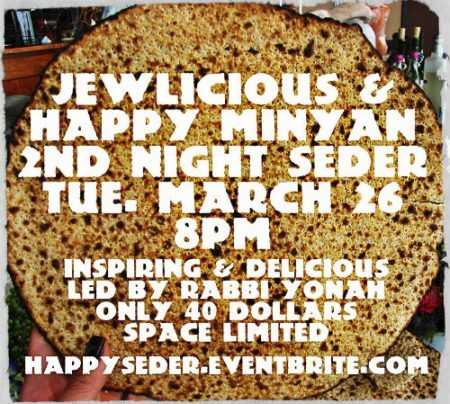 Join us for Seder first or second night – it promises to be amazing! If you would like to join us first night – we have limited space at Rabbi Yonah and Rachel Bookstein’s home. Email lauren.jewlicious@gmail.com to reserve a spot. Our interactive, inspiring, and delicious seder is fully catered and creative. Bring your friends and enjoy this great evening led by Rabbi Yonah. Rabbi Yonah brings stories from Reb Shlomo, Hasidic masters, and other sources. Bring your own short Torah’s to share too if you want! ONLY $40 Thanks to generous sponsors! Regular matzah and wine supplied. Bring your own Shmurah matzah if you want. Next Story → Official Semitic Swag Single & Music Video out now in time for Passover!